The old coal cableway („taubane“ in Norwegian) has been taken out of use many years ago now. Today, coal is transported by lorry from the mines (mine 7 is the only one still in use near Longyearbyen) to the harbour. 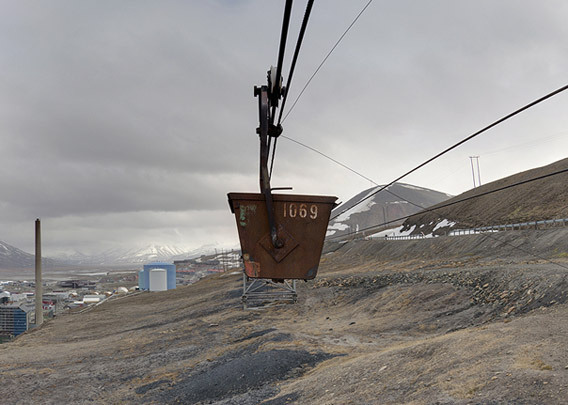 Nevertheless, the old cableway is something most people in Longyearbyen are proud of. They are real eyecatchers, visual attractions in the architecture of the whole place, they are reminders of Longyearbyen’s history as a coal mining company town and today, they are a landmark that many locals love. This part of the old coal cableway is standing next to Burmaveien above the harbour, a bit outside of central Longyearbyen. Burmaveien used to be the connection to Hotellneset (the old coal harbour) before the road to the airport was built. Today, Burmaveien is used as a walking route to the airport or camping sitee without car traffic.